At the weekend I decided to give last weeks technical challenge a go. It looked impressive but I couldn’t help thinking that it looked like a pavlova, just constructed in a slightly different way. However, I put my doubts to one side and bought a ridiculous number of eggs so that I could spend an afternoon making a mess in the kitchen. Before last week’s episode I was looking forward to desert week – I thought that I might get to try something exciting for a pudding for the long weekend. 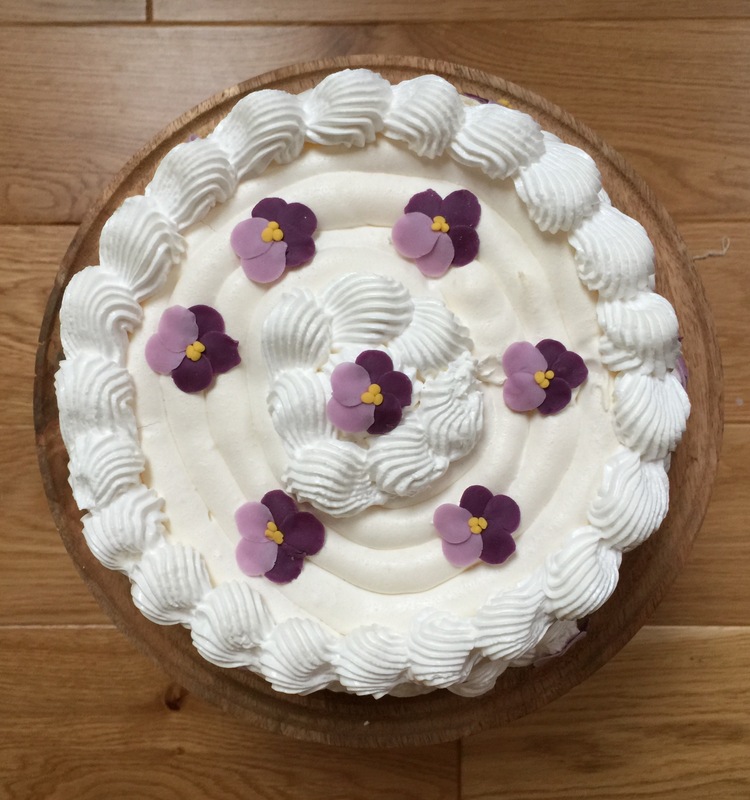 However, my suspicions about the Spanische Windtorte were true – it took me a whole afternoon to make what is essentially a giant pavlova. It tasted good and looked pretty but at the end of the day it was just a meringue shell with cream and fruit in the middle. I also didn’t think it was that technical and didn’t feel particularly challenged. If you can make a meringue, you can make this. However, I’d suggest you save your time and make a normal pavlova! Tom was working nights at the weekend so in order for him to enjoy some of it before he left, I had a bit of a mad rush to get it finished! 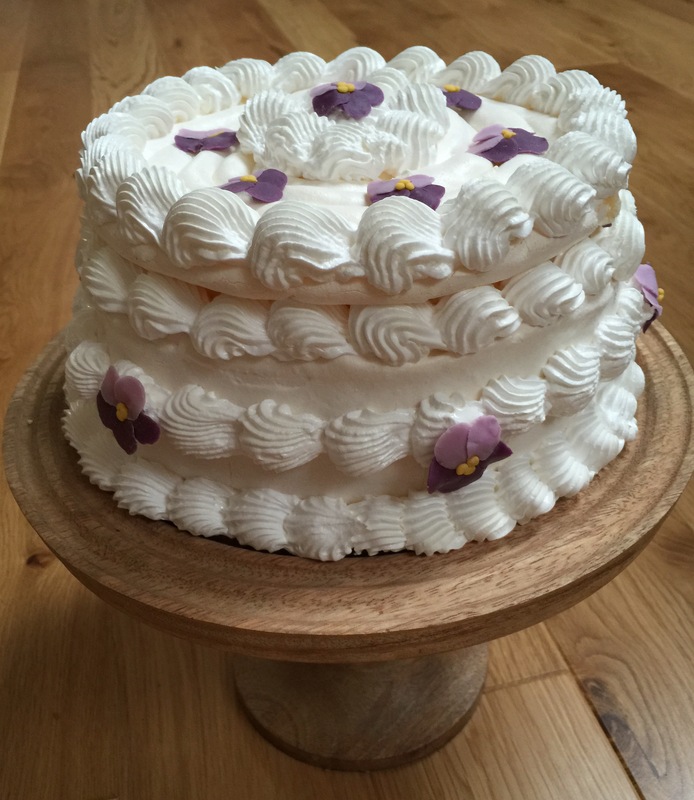 I piped Swiss meringue as fast as I could to get it baked and cooled so it could be assembled. I also tried to make the violets while cooking his dinner (so they didn’t have the hour to dry out like they were meant to). I managed to finish it just in time and took the photos on my phone as Tom was eating dinner so that I could cut it up for him to have a slice before he left. I followed the instructions and it was fairly straightforward (maybe a little messy though!). 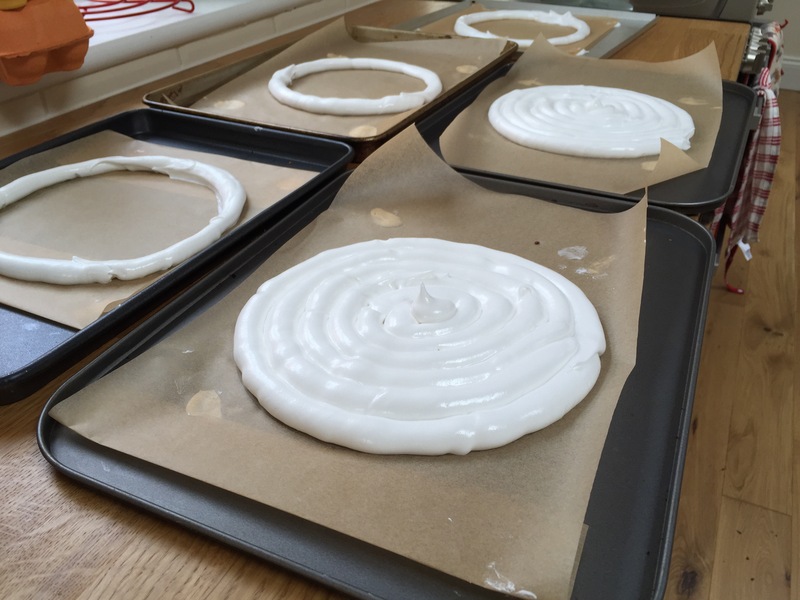 The only slightly tricky bit was making the Swiss meringue – it proved a bit harder than I’d anticipated because my digital thermometer wasn’t working properly. It said to heat the mixture to 70C, but my thermometer kept jumping between 52C and 68C and I wasn’t sure which (if either!) was correct so I just guessed and it seemed to work ok. 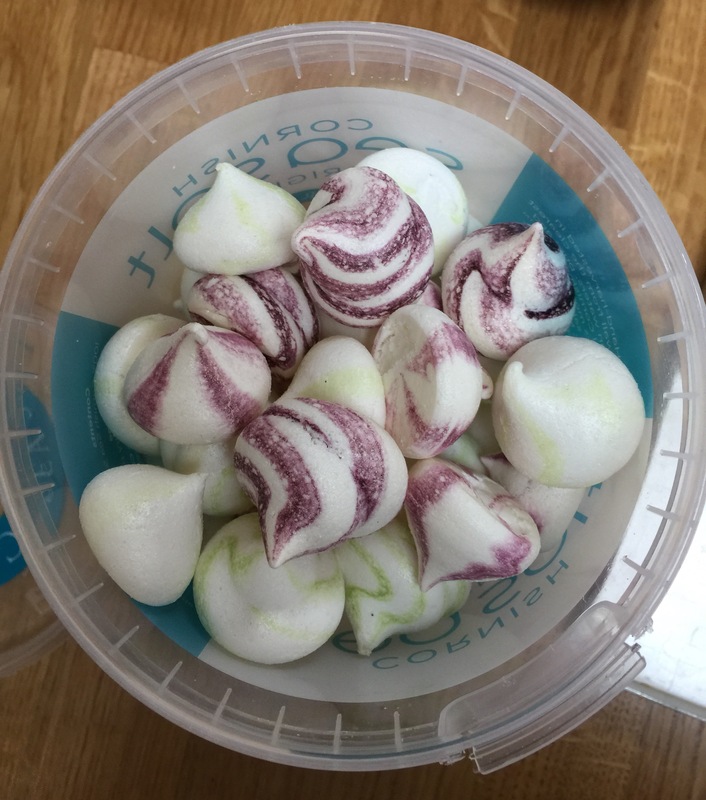 I had a bit of the French meringue mixture left so I decided to pipe a few mini meringues. I’m not sure what I’m going to do with them yet but I’m sure I’ll use them to decorate something soon! You could buy the Two Chicks egg whites for this so you don’t end up with 12 egg yolks. But, if like me you decide to buy whole eggs and separate them, you can use the egg yolks to make ice cream – I made rum & raisin and white chocolate & pistachio.